When MVMT Watches launched on Indiegogo last year, they proclaimed their frustration with paying hundreds of dollars for overpriced, name brand watches. 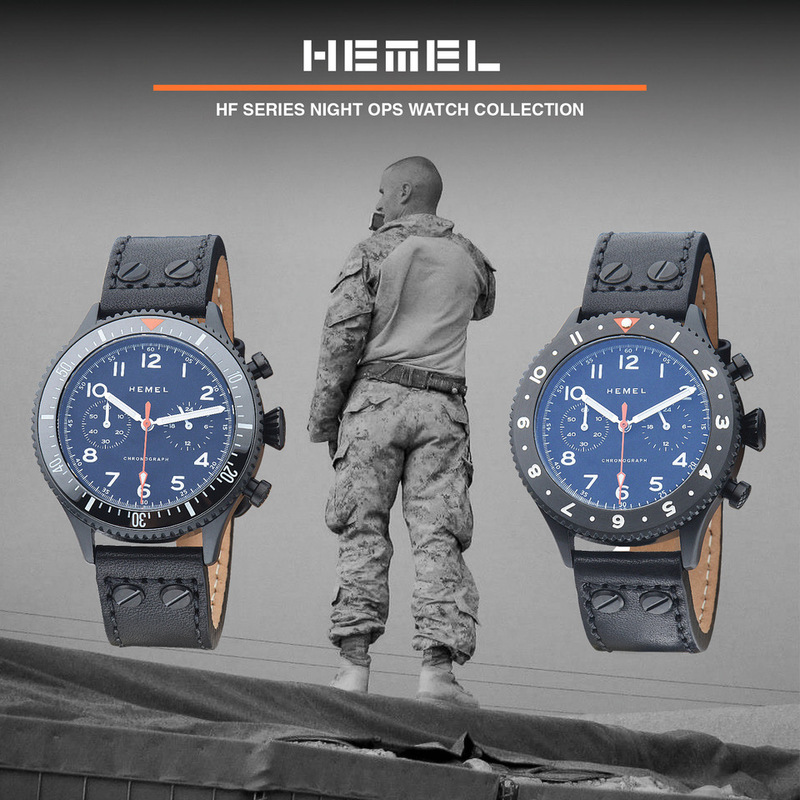 Their watch would be different, and would adhere to three key details: 1) a minimalist design that could be worn in both casual and professional settings, 2) the highest quality materials, and 3) a price less than half of their competition. With goals like these and a price of just $95 retail, the MVMT looks mighty promising, but is it worthy of the coveted Time Bum Seal of Approval? Well... Let's see. 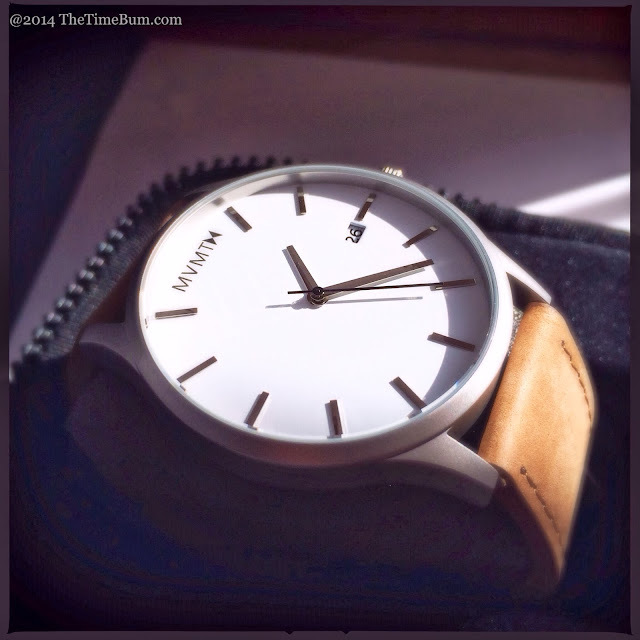 The MVMT is a large, three-hand powered by a Miyota quartz. You have a choice of a white dial in a matte case, or a black dial in a PVD case, on black leather, tan leather, or a matching bracelet. 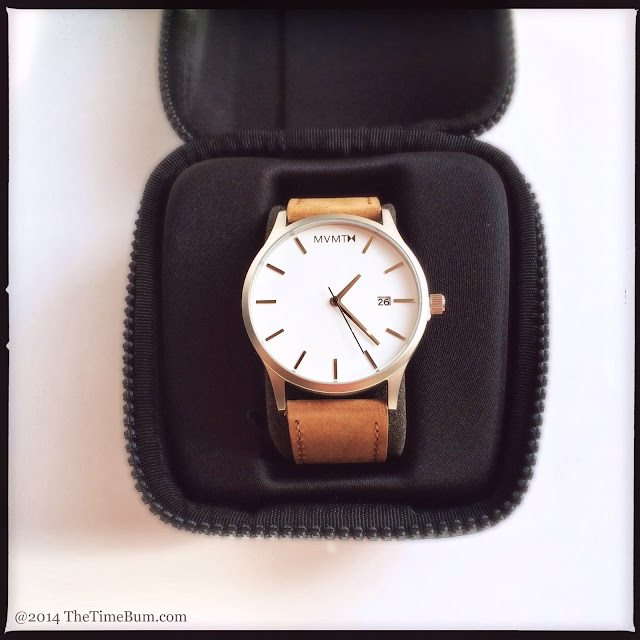 The model I reviewed was white with a tan strap. It came in a very clever padded nylon travel case. As you may know, I almost never comment on packaging, but this was pretty cool. Sadly, this was the most inventive aspect of the watch. The round, stainless steel case is 45mm wide with a slim bezel and tapered lugs. 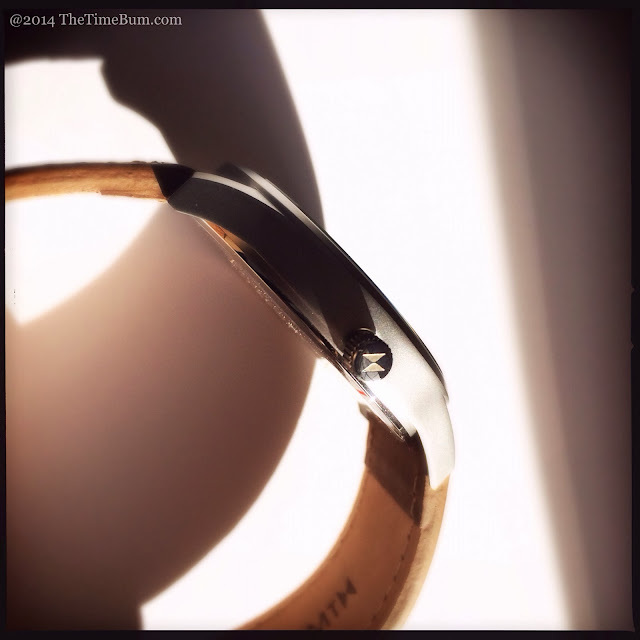 The case back is engraved with the MVMT brand and logo (a twin triangle, like a bow tie or sideways hourglass) with some basic information at the perimeter, but otherwise unadorned. The strap is thick sueded leather and 24mm wide, which is in proportion with the rest of the watch. Despite its size, it is pliant and comfortable. 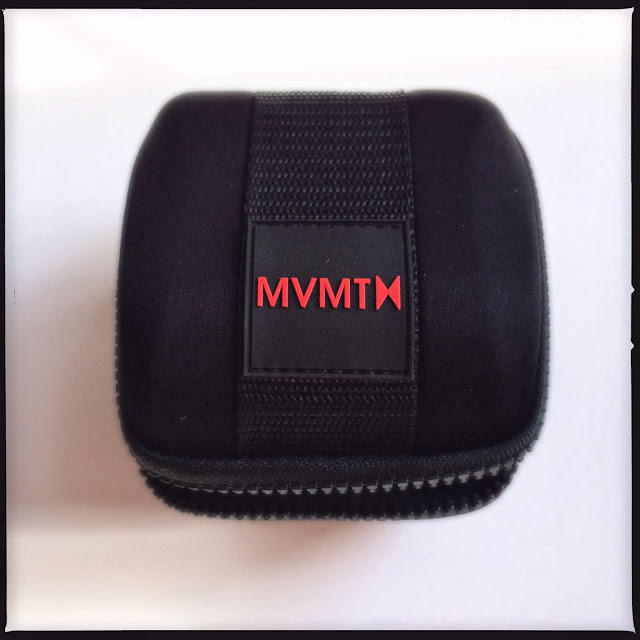 Its square buckle is etched with the MVMT brand. A small push-pull crown sits at 3:00, engraved with the bow tie logo. A flat mineral crystal tops things off. 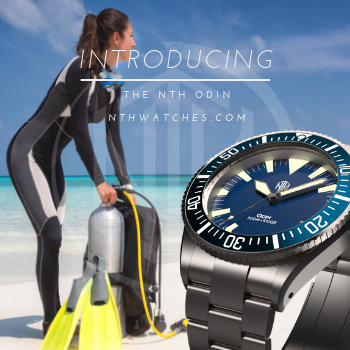 The watch is rated for only 30m water resistance. Large as it is, the watch is very light, which is good for those who may have been intimidated by its size. On the other hand, a light weight can go too far. To me, the disparity between its size and its weight made it feel insubstantial, a perception that was underscored when I tapped the case and received a hollow, tinny sound in reply. It is probably the result of having a small quartz movement in a huge case, but it does not inspire confidence. The dial is 40mm in diameter, which dwarfs many watches, but that is the only interesting thing about it. Polished and applied markers mark the hours, but they are fairly flat, so they lend little dimension to the dial. Worse still, they seem undersized in that vast field of white. There is no index for minutes/seconds. The minute and hour hands are polished. The second hand is painted black. There is a black on white date window alongside the 3:00 marker. There is nothing inherently wrong with any of this, but nothing particularly interesting either. There is a fine line between minimalist and bland. The MVMT dial comes down on the wrong side of this line. The black dial version with its red second hand and logo goes farther to address this shortcoming. The MVMT brand is positioned at 12:00, replacing the marker. This is the most noticeable feature of the dial, and to my eye, its most glaring error. The 12:00 marker, or any element that replaces it, should be a central point or have a vertical orientation so that it can perform the function of indicating the top center of the dial. The five character MVMT brand has a horizontal orientation, so it serves no function. Worse still, because the bow tie logo at the end is heavier than the typeface of the letters, it draws your eye to the right, making it appear crowded and off-center, even though it fits the space between the 11:00 and 1:00 markers. With all the available real estate on the dial, there was no need for such an awkward arrangement. Using the hourglass alone in place of the 12:00 marker would have maintained symmetry. Another option would have been to place the full brand and logo at 3:00, replacing the date window and marker. As it stands, it just does not work. They may have been shooting for minimalism, but with the huge dial, small markers, and oddly placed brand, there is no balance in the design, the effect is merely empty and uninspired. So does the MVMT meet its goals? It does have a minimalist design, and even though it is not my cup of tea, I presume anyone who orders one based on its photograph must like it. I would not call it a versatile watch. Primarily because of its dinner plate size, but the matte finish on the case and the fat strap also dress it down. A different strap or the bracelet option would change the look, but the big empty dial would still look casual. I'd say 40-42mm is the maximum size for a sneakers-to-suits watch. This is not a piece I could see wearing to the office so I can only give them half credit for the first goal. I will give them full credit for the second goal of using quality materials because a stainless steel case, mineral crystal, and Miyota quartz movement are about what you would expect at this price point, and the strap is nice. Nothing on the watch stands out, but it fits the bill. 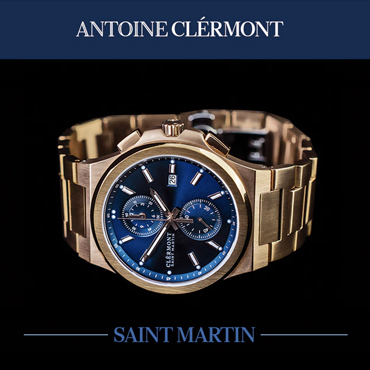 The third goal, of delivering a watch for "less than half" the price of the competition, is hard to accept. With these specs, at the current list price of $95, the MVMT competes with a great number of watches from venerable watch makers like Citizen and Seiko, to fashion brands like Fossil and Nixon. For example, the MVMT is similar in concept to the Nixon Sentry, which is still on the casual side but at 42mm, makes a more credible crossover from casual wear to professional dress. 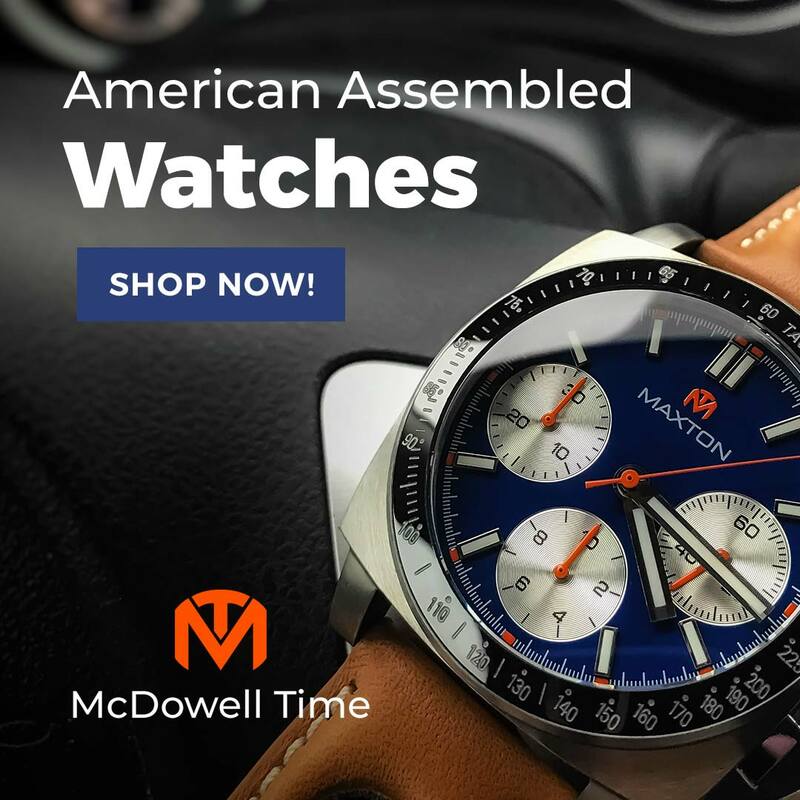 Like the MVMT, it has a Miyota quartz, mineral glass, chunky leather strap, and merely splash-proof water resistance, but it is also a more interesting and cohesive design for about $125-150. To say the MVMT undercuts it by more than half is absurd. It might have made a credible claim at the pre-order price of $59, but not at $95. This is the first example that springs to mind, but the point is, there is no shortage of watches on the market that match the MVMT's fairly basic specifications in the same price range, and quite a few that exceed it. Perhaps I am judging it too harshly. After all, MVMT's crowdfunding campaign was a runaway success, bringing in over $200k more than their initial $15k goal. Clearly, they know a thing or two about their market. Still, as The Time Bum, I am honor bound to call it like I see it. If the MVMT was more creative, had higher specs, or some element that set it apart from the crowd, I might be more inclined to recommend it, but as it stands, I cannot. Beauty is subjective, so if you are taken with the MVMT's design, then, by all means, buy one, but you can do better. Sum: Nothing special and not a bargain. The Time Bum does not approve.